A Robotic aluminum snake in an aluminum, black ABS and clear poly-carbonate environment that is view-able from all sides and ideal for mid-floor placement. The metal and poly-carbonate activity area that the snake moves across supplies the power for the snake to move through the snake’s underside. The visitor presses the start button and then the snake robot activates and the exhibit speaks an introduction. Then the visitor controls the snake to make it move a series of acrylic balls that represent snake eggs to a nesting target spot. Each time the user moves an egg to its designated nesting spot it is counted by the exhibit. When the user gets all four eggs to the nesting target area, the exhibit gives the user an excellent score. 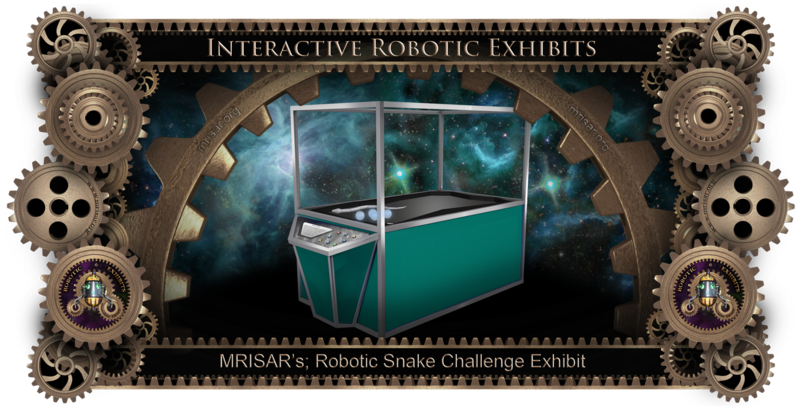 The exhibit also explains the practical applications of snake robots and forecasts future developments. Size of case is 35” deep x 7.5’ wide x 72” high.